Everybody loves our twice-annual record fair. So with a roof over our heads for the winter, we're throwing in a special bonus *mini* fair with 10 top vendors the weekend of February 8+9. (The first outdoor fair is set for Saturday, May 10.) Stay tuned for guest DJs and special items for sale, and we'll see you at the crates! 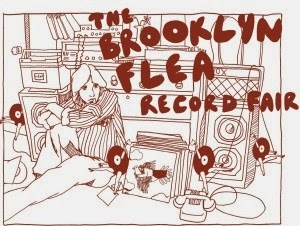 > SaveMor provides promotional post card for Brooklyn Flea events.